The threadcount indicates the colour stripes of the warp and weft in sequence and the number of threads in each stripe. It has been described as the DNA of a tartan. The designer of your tartan should be able to provide you with the threadcount or a weaver's ticket. A threadcount can also be taken from a woven sample, providing it is large enough to show the full sett. Your application must include the threadcount for your tartan otherwise it will be refused. Please ensure that the threadcount you submit is correct as it cannot be amended after the tartan has been registered. Please use the links below to access more detailed information on threadcounts and how they should be presented. Means 24 threads of B (blue) followed by 4 threads of W (white), 24 threads of B (blue), 2 threads of R (red), 24 threads of K (black), 24 threads of G (green), and another 2 threads of W (white). Tartans are either symmetrical/reflective patterns or asymmetrical/repeating patterns. The threadcounts for these two types of patterns are presented slightly differently so that the weaver knows which type of pattern he is setting up on his loom. Symmetrical or reflective patterns are so called because the complete sett or pattern contains lines of symmetry or reflection at the pivot points. The pivot points are located at the lines of reflection in the pattern. At each pivot point the pattern is reflected, as in a mirror image - please see the image below. The 'first' pivot is usually the colour which appears earliest in the alphabet. Where there are, for example, blue and white pivot points, the blue is taken as the first pivot and the white as the second pivot. Because the pattern reflects, only half the threadcount needs to be provided - the user will know that the second half of the threadcount is a mirror reflection of the first half. Where the pattern does not reflect it is known as an asymmetrical or repeating pattern. 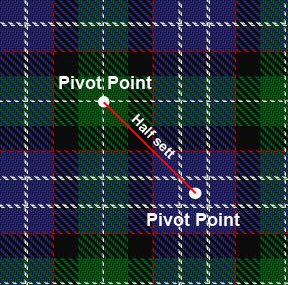 There are no pivot points in an asymmetrical pattern: when reaching the end of the pattern it repeats from the beginning again - please see the image below. The capital letters used in a threadcount are colour codes which describe specific shades of colour. Please explain the codes you have used. You can open and print a list of the colour codes which SRT Administrators will use to generate the image of your tartan which will appear on the Register. For most tartans the warp and weft are virtually identical and only one threadcount is required. Occasionally however a tartan has significant differences between the warp and weft (which creates a pattern of rectangles rather than squares). If your tartan has different threadcounts for the warp and weft then you will need to supply both threadcounts in your application. The size of a sett will depend on how you wish to use your tartan. A 2-3 inch sett may be more appropriate for a tie, whereas a 6-7 inch sett will be needed to make up a kilt or skirt. A six inch sett will normally be made up of a total of approximately 240-260 threads. For the purposes of registration the threadcount for a six-seven inch sett should be provided. A check is a very simple form of tartan, comprising small regular blocks of colour without overchecks, bands and stripes. It will generally have fewer than 100 threads in the threadcount. 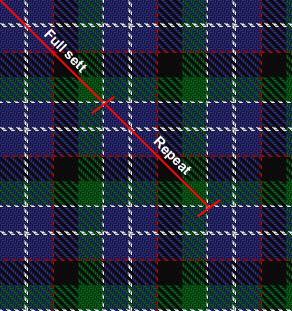 The descriptor 'Check' may be added to the name of a design submitted for registration if it is considered to be more of a check than a tartan.